If you're like most people you really have no clue where to start when it comes to choosing the best dating site to meet your needs. I'm Carmelia Ray, online dating expert with Top10BestDatingSites.com, here to share with you what I've learned from working with singles and helping them choose the best dating site. For starters you need to consider the TYPE of relationship you're looking for! Are you looking to hook-up, casually date if you're like most singles out there, you might really be looking for love. There are dating sites out there to meet every type of dating need. Choose a dating site with members who share the same relationship goals as you! Secondly, there are FREE sites and there are PAID sites. Paid sites have a tendency to attract singles that are MORE serious about investing their love lives. 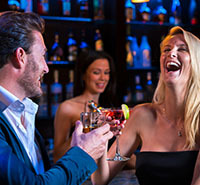 It is up to you to prioritize your dating life and decide how much to invest in online dating. Just remember, it might be worth it in the long run to pay a few dollars a month for stellar matchmaking and compatibility testing. More than half online daters are using a mobile device or tablet to log into their profiles on a wide array of dating sites. A mobile compatible site and user-friendly app are both features you should be checking out if you plan to do most of your online dating and surfing on your phone. Don't tie yourself down with a dating site that can really only be accessed from a desktop computer! Find a mobile app that's easy for you to use. Be sure to check out our reviews to see which service offers YOU the most opportunity to connect with your ideal match.